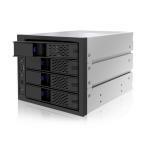 Introducing the new face of Icy Dock screw-less technology, the FlexCage MB974SP-B 4-in-3 SATA Backplane. 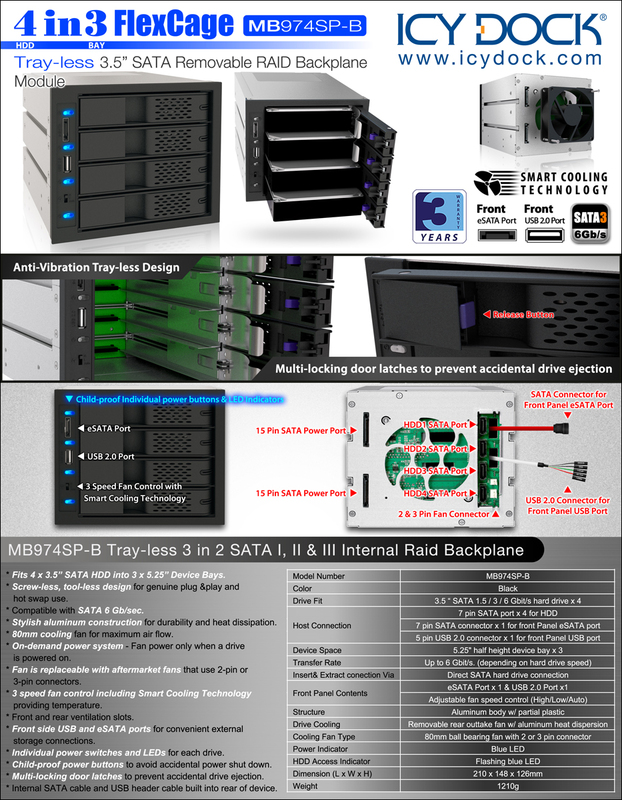 This product allows the user to install 4 x 3.5” SATA hard drives into a computer case’s 3 available 5.25” device bays. 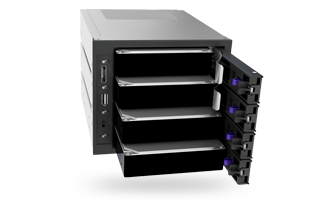 Using our world renowned screw-less technology, no screws or tools are required to insert or eject the drives making hot swapping a completely hassle free experience. The front of the device includes childproof power buttons for each drive which require the button to be pressed slightly deeper than normal to ensure that a drive is not accidentally turned off by bumping into it or rubbing against it. These power buttons also act as an LED indicator showing drive power and activity. Similarly, each drive door has a multi-locking latch mechanism to prevent a door from being opened easily, making it an ideal solution for systems where IT and non-IT personnel have access. Also on the front are USB and eSATA ports to quickly and easily connect external storage peripherals, especially useful for cases that do not have front/top port access. On the rear of the MB974SP-B is a monster 80mm cooling fan to pull cool air from the front ventilation slots, over the drives, and exhaust the warm air out through the rear ventilation slots. The fan also features an “on-demand” power system, so that the fan is only powered on if a drive’s power is on. So even if all 4 slots are filled, the fan will only spin if one of the drives is powered on. 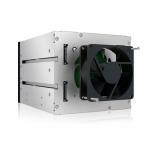 And if the included fan is not enough, it can be upgraded to use most aftermarket 80mm case fans that use a 2 or 3 pin connector, giving the user a wide range of choices according to their preferences. To further the user’s customization, a 3 speed fan control is built in letting the user choose between high, low, or auto. The auto setting uses our Smart Cooling Technology to adjust fan speed according to the cooling requirements of the drives. An internal SATA cable and USB header connector are also built into the rear for easy connection to the systems motherboard or add-on card. "Without a doubt IcyDock has brought amaizing products to the market that any consumer should be proud to own. 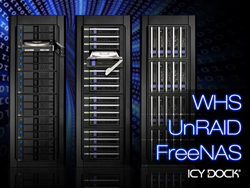 We had no performance issues and it is really a no brainer that IcyDock is the way to go!" 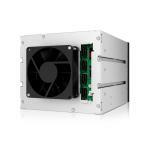 "The Icy Dock 4-in-3 internal RAID backplane does what it's supposed to do, a common refrain when looking at Icy Dock products. 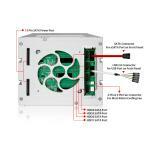 We found it to be reliable, intuitive to use and hard to find much fault with." 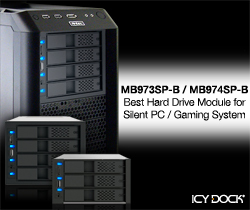 "Through various tests the Icy Dock MB974SP-B performed quite well in terms of ease of use and function as well as speed. 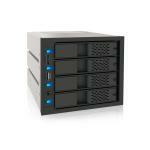 Having the ability to quickly change out hard drives is very useful and that is precisely what this product offers. Perhaps the nicest feature Icy Dock included is the safety and security systems that prevent accidental shutdowns; no longer will users have to worry about accidentally hitting a button and crashing their computer." 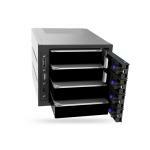 "If you need extra storage space in your system the MB974SP-B is the perfect thing."